gf choc chip cookie IV, originally uploaded by shaunaforce. Sometimes, you just need some chocolate chip cookies. For the past four or five days, I have been trying my best not to complain. I have also not been writing here, even though I have wanted to post new recipes and delighted paragraphs about the sensory pleasures of new tastes exploding on my tongue. The problem is, there haven’t been too many new tastes on my tongue. I’ve hardly eaten food this week, and what I have eaten has been bland. Oh, I hate being sick. A vile virus has rushed through my body and left me depleted. Raw throat, pounding head, congestion clogging every part of me, and a pounding of exhaustion I have not felt since before I stopped eating gluten. I’ve spent much of the past week either coughing from deep in my lungs or whimpering. On Wednesday, I lay in a fetal position in a corner of the couch, all day long, so delusional from high fevers that I actually spent six straight hours watching Project Runway on Bravo. (That Santino -- what a twerp.) When I’m watching television for more than an hour, I’m clearly not doing well. Last night was the low point. About 3:30 in the morning, I was awoken, again, by my sore throat, which felt like three people raking hot forks against my vocal cords. My fever forced me to kick off the covers, frantically. The lukewarm water by my bedside did nothing to mollify the tearing pain in my throat. Groggy and unhappy, I stumbled into the bathroom to search under the sink for some kind of sore throat relief. Ah! Ricola. I found five old Ricola cough drops, swollen and sticky against the wrappers. Still, they’d probably do the trick. Just as I was unwrapping one and starting to put it into my mouth, I realized, “Ah merde. I don’t know if this is gluten-free.” So I put on my glasses and fired up the internet, and searched for “Ricola gluten-free.” Thanks to the internet, I found out — nope, I couldn’t have that relief after all. Why do cough drops need gluten? So, in the face of this senseless suffering, there haven’t been too many lavish feasts around here. But there were chocolate chip cookies. It seems that everyone else in the food blog world is eschewing baked goods, sugars, and starches. Well, not me. It’s still raining in Seattle, and I’m not eating much anyway. Might as well make the most of the bites I am having. On Wednesday, I made a homemade chicken soup with millet, which filled me well and fulfilled my desire to have some kind of hot liquid down my throat all day long. By the end of the day, the millet had expanded fully and became a chicken-millet stew. That was one day. On Thursday morning, when I felt just a touch better, I woke up and knew I had to make some chocolate chip cookies. When I was a kid, I learned how to make chocolate chip cookies from scratch, based on the recipe on the back of the Toll House chocolate chip bag. 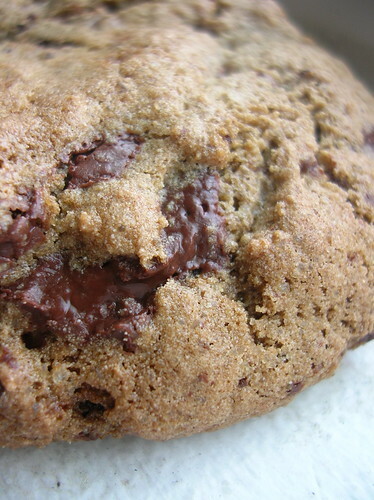 Over the years, I perfected cookie baking: thin, crispy cookies with a brittle bite; enormous cookies that called for me to set aside everything else and simply savor them; chewy cookies that oozed a bit of chocolate on my tongue. My oatmeal raisin cookies were considered so outrageously chewy, tasting of hand-made love and nutmeg, that I once Fed-Exed a big box of them overnight to someone with whom I was hopelessly in love. (It didn’t work out with him, but that wasn’t the fault of the cookies.) Before I stopped eating gluten, I could wake up any morning and whip up a batch of cookies to bring to work or feed my friends, without even thinking about it too much. After my celiac diagnosis, though, I gave up on the notion of making my own cookies again. I took my Pillsbury baking book, dusted with flour, the pages stuck together with butter, and gave it to my friend, Dorothy. Obviously, I’d never be using that again. It took me months of cooking every night, finding my way through my tastes, until I had the heart to start baking again. Now, however, I just can’t be stopped. Fig newtons, apple pies, gingerbread, chocolate-banana bread — gluten-free baking simply doesn’t scare me anymore. Now, it’s simply baking. Maybe, in the face of feeling foreign in my body, I needed to return to a familiar activity. The dark-grey winter seems to call out for butter, sugar, and flour, even if it is gluten-free flour. Even though I still feel fairly rotten, these cookies have been sustaining me in a way that nothing else can. Now, you’ll have to excuse me. I have to go and drink some more hot lemonade. Slightly cakey, chewy and moist, chocolate arriving in melted chunks — these cookies are sure to please anyone, not just those who can’t eat gluten. Just one piece of advice: don’t forget to add the salt. For those of you who don’t know, a touch of salt is essential in baking cookies, to cut the sweetness and give each bite layers of taste. Somehow, even with all this baking experience, I forgot to add the salt into the first batch of these. My friends Anne and Rick came up with the trick to defeat the over-sweetness, however: we sprinkled sea salt on the top of the cookies before chewing them. This may sound ridiculous, but we were sighing happily as we ate. Preheat the oven to 350°. If you have one, lay down your Silpat on your baking sheet. If you don’t, then you should buy one. But for now, line the baking sheet with parchment paper. Mix together all the gluten-free flours (remember to measure them accurately, since every ounce counts here), plus the baking powder and soda. Don’t forget the salt! Set this bowl aside. Using the paddle attachment on your stand mixer, cream the butter, sugars, and hot chocolate powder together, briefly, until they are mixed well and starting to grow fluffy. (This should be about two minutes.) Add the eggs and gluten-free vanilla. Put in all of the flour mixture at once and stir briefly, until just mixed. Add the chocolate chunks, then chill the mixture in the refrigerator for at least fifteen minutes. For the right ooey-gooey consistency, plop large balls of dough, about half the size of the palm of your hand, onto the Silpat or parchment paper. Bake for about twelve to fourteen minutes, depending on your oven. When you remove the cookies, the tops will be ever-so-soft. Allow them to cool on a baking sheet for ten minutes before removing to a plate, or your mouth. I am pretty sure I could live gluten free if I had these cookies to nibble on (OK, devour) every day. Yes, definitely! I especially like the addition of the spicy hot chocolate powder. The chilies will make you feel better soon! I'm finally on the mend myself. Sorry to hear that you were so ill... though with close to 30 straight days of rain I think I would go stir crazy and it is understandable why anyone would be sick! Love your Blog ~ keep up the good work! yum yum YUM! Chocolate chip cookies melt my heart too. I'm currently in recovery from a burny-death throat virus and a snot monster duking it out in my head, so I heartily sympathize with your malady. May you recover speedily and fully. When I'm sick I swear by hot ginger tea with lemon and honey. It's better than Ricola, too! Hey, salt on cookies isn't nuts! It's why Pierre Herme's Korova cookies are my fave chocolate chip cookie. What is sweet rice flour? there are so many celiac people in turkey. I wish they'd all speak english so I could tell them about your website. I guess I can live gluten free with your recipes, although I don't have to. So sorry you have been so sick. I had a similar affliction for 3 weeks over the holidays and now am on the mend from a broken kneecap--so I know what you mean about the TV watching. It is weird what we force ourselves to endure when we are sick! Your cookies look wonderful & I love the idea of salt on the top. I can't cook yet because of the knee, but your recipe is definitely on my list. I have the rice flour and will shop for the other ingredients. Love Dagoba products too. Use some of that sea salt in warm water for the throat! Hope you feel better! The sense of taste regained is the best friend, and I am sure you must look forward to this. Those cookies look so good I would risk exposure of contracting hot coals to the throat for a bite. Isn't it amazing how something yummy can soothe us during those tough times? I hope that you are able to have more savory bites to get you through this rough period. Hi Shauna - If you are going to send some rain this way, can you please include some of these delicious cookies? Poor baby - I hope you feel better soon. There is nothing worse than feeling sickly, wishing for something soothing and no one there to make it for you. Best throat remedy - ginger tea with honey: recipe - steep a slice of fresh ginger in boiling water or steep along with your favorite herbal tea for 4-5 minutes, ad a spoonful of honey and sip slowly, cupping the warmth of the mug in your hands while huddling under a cozy blanket. Oh honey, I hope you feel better soon. These cookies look amazing, and I'm glad that you're back to trying baking in new and different ways. Be well. Those look scrumptious ... and my mouth is seriously watering! Hey Shauna-- It's been quite a while since I touched bases with you. Sorry to read you've been sick and hope you're on the way back up! So, if I can't find this particular chocolate powder, can I find a suitable substitute? I'd like to try these cookies out! Take care! They look so yummy...... I hope they'll work with agave instead of sugar! teff flour is not readily available in australia. do you have any subsitution suggestions? Hi I am ona gluten - free diet to. 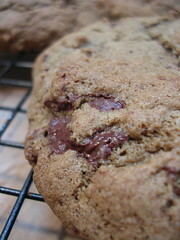 I have just discoverd your blog and I think it's wonderful I love the ooey gooey cookies story! Thank you for your wonderful blog! I discovered I am gluten intolerant and have been mourning the loss of baked goods. I tried these last night but was unable to find millet flour and substituted a 1/2 cup of rice flour on the advice of the Whole Foods worker (who is also gluten free). I also only had cocoa on hand, not the hot chocolate mix, so subbed that in, too. They are very good, but still grainy. Is this what I must always expect of gluten free baked goods? Also, I live in Denver and wonder if there are any other adjustments to be made for our altitude? They did bake up nice and chewy, so I'm thinking the answer is no. mmmmm....thaaaank you! I am just recovering as well and when I got home from a day of physics and math and learnt that my mom had decided to treat my dad and I to some cookies I was elated. My sister helped us clean up the gooey messy ones that we decided to take before the cookie jar.